Luis Solis from Milwaukee, Wisconsin is currently 8-1 in YCS Pasadena with his Trickstar Deck that features a bunch of Sky Striker cards. 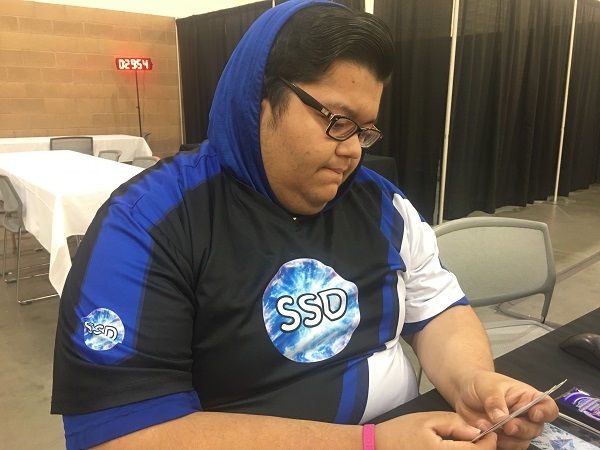 He’s one of the few Trickstar Duelists remaining in the tournament, but needs just a couple more victories to secure his spot in the Top 32. Now he’s facing off against Darren Stephenson from England! 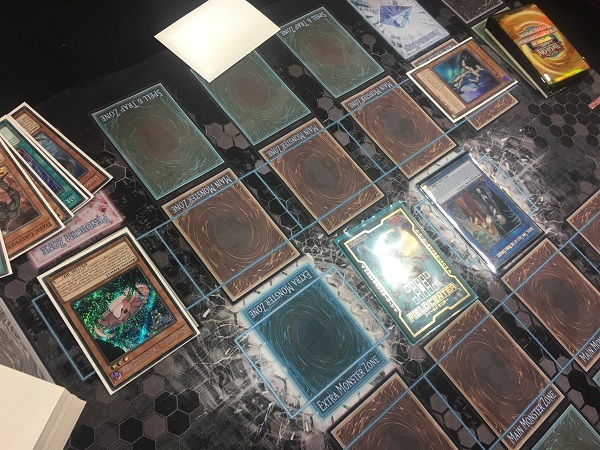 Stephenson traveled to the United States specifically to compete in this tournament, and is looking for a YCS victory with his DARK Gouki Deck! Stephenson suffered his first loss of the tournament in yesterday’s Round 9 Feature Match, but now is his chance to redeem himself! It’s time to Duel! Stephenson won the die roll and chose to go first. He started off the Match by discarding Danger! Nessie! to Special Summon Dark Grepher from his hand and then used Nessie’s effect to add Danger!? Tsuchinoko? from his Deck to his hand. He discarded Tsuchinoko to use Grepher’s effect and send Destiny HERO – Malicious from his Deck to his Graveyard and then Special Summoned Tsuchinoko to the field. He banished Malicious from his Graveyard to try to Special Summon another Malicious from his Deck, but Solis discarded an Ash Blossom & Joyous Spring to negate it. Next, Stephenson activated D.D.R. – Different Dimension Reincarnation to Special Summon Malicious back to the field and Link Summoned Isolde, Two Tales of the Noble Knights! He used its effect to add Blue Mountain Butterspy from his Deck to his hand and then sent Divine Sword – Phoenix Blade, Living Fossil, and Overdone Burial from his Deck to his Graveyard to Special Summon Neo-Spacian Aqua Dolphin from his Deck with Isolde’s effect. He discarded Blue Mountain Butterspy to use his Dolphin’s effect. 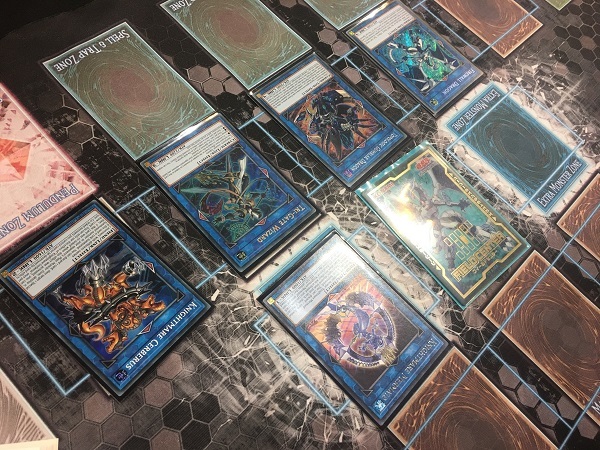 Instead of revealing his hand of Sky Striker Mecha – Hornet Drones, Trickstar Lycoris, and 2 more copies of Ash Blossom & Joyous Spring, Solis chose to concede. An explosive hand for Darren Stephenson allows him to take a quick victory against Luis Solis in Duel 1! Solis opened up Duel 2 with Terraforming, Pot of Desires, Sky Striker Mobilize – Engage!, Ghost Belle & Haunted Mansion, and Scapegoat. He activated Sky Striker Mobilize – Engage! to add Hornet Drones to his hand and then activated Terraforming to add Trickstar Light Stage to his hand. He activated Light Stage and used its effect to add Trickstar Candina to his hand and then used Pot of Desires. He banished the top 10 cards of his Deck face-down to draw Trickstar Lycoris and another Scapegoat from his Deck and then activated Hornet Drones to Special Summon a Sky Striker Ace Token to the field. He used the Token to Link Summon Kagari and used Kagari’s effect to return Sky Striker Mobilize – Engage! from his Graveyard to his hand. He activated Engage to add Sky Striker Mecha – Widow Anchor to his hand and draw Called by the Grave and then Normal Summoned Candina. He used its effect to add Trickstar Reincarnation to his hand and then used Kagari to Link Summon Sky Striker Ace – Shizuku. He Set 4 cards to his back row, then returned Candina to his hand to Special Summon Lycoris. In his End Phase, he added Sky Striker Mecha – Widow Anchor from his Deck to his hand with Shizuku’s effect. Stephenson drew a card, dropping down to 7600 Life Points due to the effects of Light Stage and Lycoris. He Set 2 cards to his back row and then Normal Summoned Armageddon Knight. He used its effect to send Destiny HERO – Malicious from his Deck to his Graveyard, prompting Solis to flip Called by the Grave to banish it. Stephenson activated Instant Fusion next, giving up 1000 Life Points to Special Summon Invoked Raidjin from his Extra Deck. He used Raidjin’s effect to put Lycoris face-down and then Set a card to his back row. He combined Raidjin with Armageddon Knight to Link Summon Isolde next, and used Isolde’s effect to add Blue Mountain Butterspy from his Deck to his hand. He activated Isolde’s effect next, sending Divine Sword – Phoenix Blade and D.D.R. – Different Dimension Reincarnation from his Deck to his Graveyard to Special Summon Gouki Headbatt to his field. He combined Headbatt with Isolde to Link Summon Summon Sorceress and then used Headbatt’s effect to add Gouki Suprex to his hand. He flipped The Phantom Knights of Shade Brigandine next, Special Summoned it Linked to Summon Sorceress, and then used his Sorceress’s effect to Special Summon Gouki Octostretch from his Deck. He banished 2 Warriors from his Graveyard to return his Phoenix Blade to his hand. Next, he combined The Phantom Knights of Shade Brigandine with Octostretch and Summoned Knightmare Phoenix. He used the effects of Octostretch and Phoenix. Phoenix’s effect destroyed a face-down Trickstar Reincarnation, and Octostretch’s effect add Gouki Re-Match from Stephenson’s Deck to his hand. He activated the Re-Match, but Solis discarded Ghost Belle & Haunted Mansion from his hand to negate it! Stephenson flipped Living Fossil next, Special Summoning Gouki Headbatt from his Graveyard. He combined Headbatt with Summon Sorceress to Link Summon Firewall Dragon Linked to Phoenix, and then used the effect of the Divine Sword in his Graveyard to banish 2 Warriors from his Graveyard and return the Divine Sword to his hand. Next, he used Knightmare Phoenix as a Link Material to Summon Knightmare Mermaid co-Linked to Firewall, and used the effects of the Mermaid and the Firewall. He Special Summoned Iblee from his Deck, drew a card, and Special Summoned Suprex from his hand. He combined Suprex with Iblee to Link Summon Underclock Taker next, and used the effects of Firewall and Suprex. He added Gouki Twistcobra from his Deck to his hand and then Special Summoned it with the Firewall’s effect. He combined Underclock with Suprex to Link Summon Knightmare Unicorn co-Linked to Firewall, and used the effects of Unicorn and Firewall. He sent a card in the back row to Solis’s Deck, drew a card, and Special Summoned Octostretch from his hand. He used Octostretch to Link Summon Linkuriboh, then Special Summoned The Phantom Knights of Ancient Cloak from his hand. He combined Ancient Cloak with Linkuriboh to Link Summon Binary Sorceress, then used Firewall’s effect to Special Summon Armageddon Knight from his hand. He used Armageddon Knight’s effect to send Dark Grepher from his Deck to his Graveyard and then banished Ancient Cloak from his Graveyard to add The Phantom Knights of Silent Boots from his Deck to his hand. He then combined Binary Sorceress with Armageddon Knight to Link Summon Tri-Gate Wizard and Special Summoned Silent Boots from his hand with Firewall’s effect. He banished Armageddon Knight and Dark Grepher from his Graveyard to return his Divine Sword to his hand and then used his Firewall’s effect to return Shizuku to the Extra Deck and return Iblee from his Graveyard to his hand. 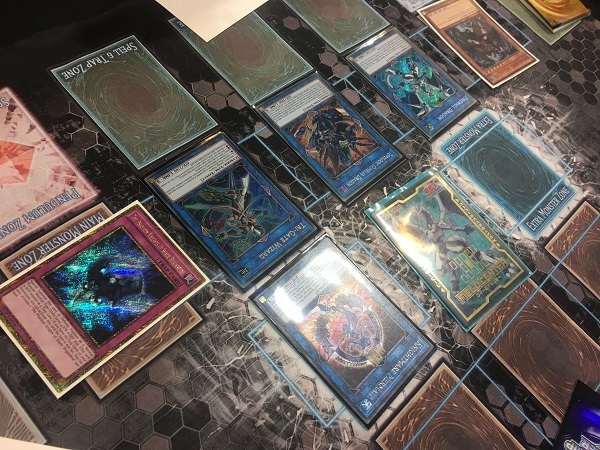 He combined Mermaid with Silent Boots to Link Summon Knightmare Cerberus next, co-Linked with Tri-Gate Wizard, and then Special Summoned Iblee from his hand with Firewall’s effect. He used Tri-Gate’s effect to try to banish Solis’s face-down Scapegoat, and Solis Chained it to Special Summon 4 Sheep Tokens. Next, Stephenson used Iblee to Link Summon a Mermaid co-Linked to Tri-Gate and used Firewall’s effect to Special Summon a Malicious from his hand in Attack Position. Stephenson then entered his Battle Phase and cleared Solis’s field with his monsters’ attacks. In Main Phase 2, Stephenson combined Unicorn with Malicious to Link Summon Topologic Gumblar Dragon and ended his turn, just short of an Extra Link. Solis drew a card and then had Trickstar Lilybell, Trickstar Candina, Scapegoat, and Sky Striker Mecha – Widow Anchor in his hand. He Summoned the Candina and used its effect to add Trickstar Lycoris to his hand. He banished Trickstar Reincarnation from his Graveyard to try to Special Summon Lycoris back from his Graveyard, and Stephenson negated the effect of the Reincarnation with Tri-Gate Wizard. Candina attacked into Knightmare Mermaid next. Candina’s Attack Points were down to 800 due to the effect of Mermaid, and Solis lost 200 Life Points and his Candina. With Candina off of his field, he was free to activate Widow Anchor. He used the Widow Anchor to take control of Tri-Gate Wizard and then attacked Knightmare Cerberus with Tri-Gate, destroying the Cerberus and dealing 600 points of damage to Stephenson’s Life Points. Solis Set Scapegoat before passing his turn and returning Tri-Gate Wizard to Stephenson. Stephenson banished Malicious from his Graveyard to Special Summon another copy from his Deck and then used the effect of his Gumblar Dragon. 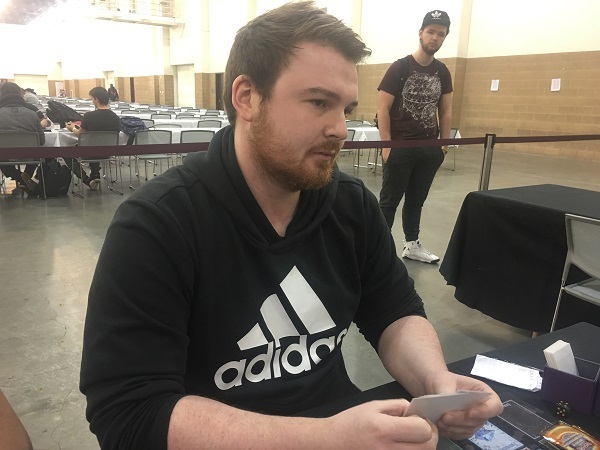 He discarded 2 cards from his hand at random to force Solis to discard the last 2 cards in his hand, and then used his Tri-Gate’s effect to try to banish Solis’s face-down Scapegoat, which Solis Chained. Stephenson destroyed all 4 Sheep Tokens in battle and Set The Phantom Knights of Shade Brigandine before passing. Solis drew a card and then Stephenson activated The Phantom Knights of Shade Brigandine to Special Summon it! He used Gumblar’s effect to discard the card Solis had just drawn, and Solis finally conceded. Darren Stephenson takes a 2-0 victory over Luis Solis’s Trickstars to advance in the tournament with a 9-1 record using his DARK Gouki Deck!